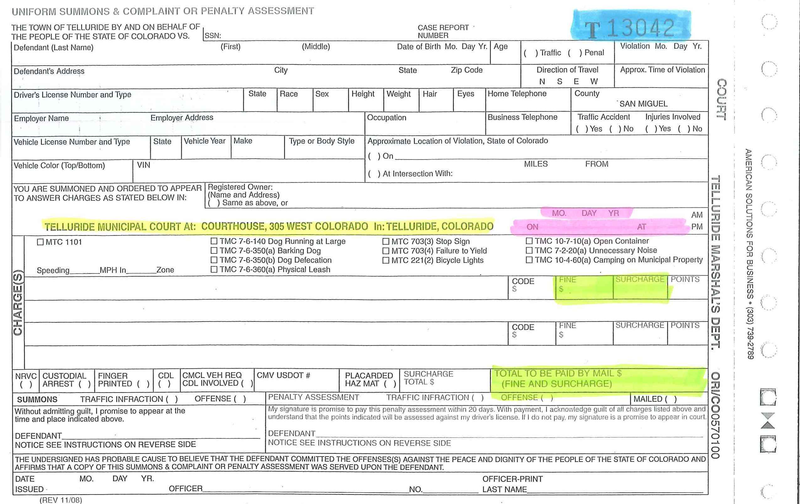 Yellow: Fines are indicated on the right-hand side of the citation. If you pay on or after your court date, your fine doubles. If you are mailing your payment, the payment must be received before the court date (the envelope must be postmarked prior to the due date). Green: This is the arraignment date. If you choose to contest your ticket, this is the date you must appear in court. Payments for parking tickets may be made as described on the Payments page. Blue: The citation number is the reference number used by the Municipal Court. This number appears in the upper far right corner and begins with a “T.” The Case Report Number is the reference number used by the Marshal’s Department. Yellow: This is the court into which your citation was written. There are two separate courts. Only contact the court that appears in this section. The Telluride Municipal Court phone number is (970) 728-2158. The San Miguel County Court can be reached at (970) 369-3300, and you are not on the correct website. Green: This is the amount of your penalty assessment. If there is no number written in by the marshal, you have been given a summons, which requires a court appearance. See the information under the pink segment below. Pink: This is your court date. If your fine is not paid before this date you must appear in court on that day. If you have been cited for a mandatory court appearance violation (summons) you must appear on this date and time. Failure to appear in court may result in the doubling of fines, the addition of court costs, and/or the issuance of a bench warrant for your arrest. Contact the court clerk if you are unable to attend your court date. If you fail to appear and have not received notice of a continued court date, you may be issued a bench warrant for your arrest, and if your citation is for a traffic violation, the Motor Vehicle Department issuing your driver’s license will be notified of your default.